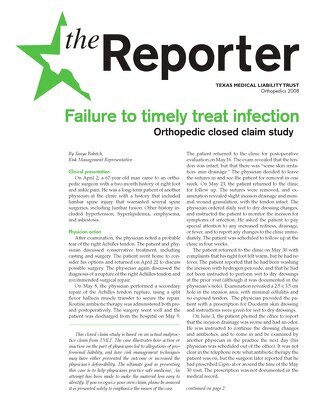 A 28-year-old woman came to an orthopedic clinic with right hip pain lasting for two weeks. Orthopedist A’s physician’s assistant (PA) examined the patient and obtained x-rays. The results of the exam were “normal” and “no bony abnormalities” were found in the x-rays. The PA diagnosed trochanteric bursitis, and the patient was instructed to apply heat and take nonsteroidal anti-inflammatory drugs. 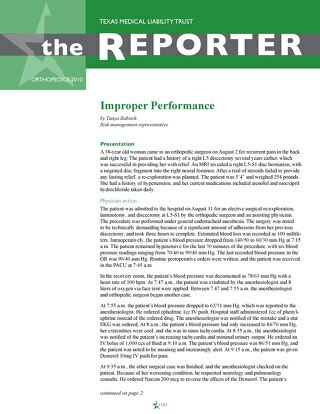 The patient returned to the clinic a month later with continued hip pain and was treated by the same PA. An injection of lidocaine, bupivacaine, and dexamethasone was administered in the right trochanteric bursa. No additional x-rays were obtained, and the patient was scheduled to return in one month. Orthopedist A was not consulted about the patient’s symptoms or x-ray results from either visit. Three weeks later, the patient returned to the clinic with disabling pain in the right hip after a fall. Upon examination by Orthopedist B, x-rays were taken that revealed a fracture at the base of the cervical aspect of the femoral neck. X-rays from the original visit were re-examined and interpreted to show a stress fracture of the right hip. The next day, Orthopedist B took the patient to surgery for an intramedullary nailing of the right femoral neck. The patient was discharged three days later with orders for physical therapy, occupational therapy, and home health care. At the patient’s first postoperative visit with Orthopedist B, her incisions were noted to be healing well. The patient was instructed to continue “toe-touch” weight bearing and to return in four weeks. 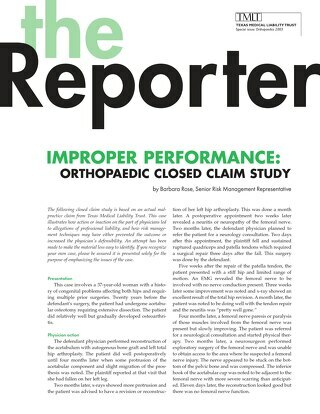 On follow-up appointments, Orthopedist B noted the patient reported pain over the greater trochanter, but denied groin pain when full weight bearing. X-rays at the first follow up showed “no evidence of fracture healing.” At each visit, the patient was instructed to weight-bear as tolerated in hopes of stimulating bone growth. After another fall, the patient returned with groin pain. 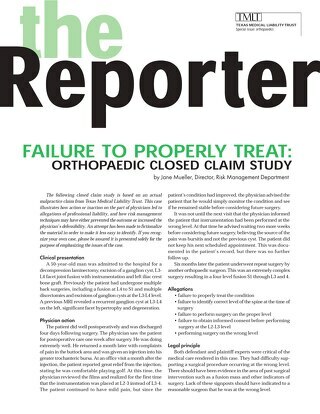 X-rays were negative for hardware failure or fracture displacement, but showed evidence of incomplete healing. CT scan revealed a nonunion of the femoral neck fracture at the base. Orthopedist B recommended treatment with a bone stimulator. At her next follow-up visit, the patient was treated by Orthopedist A. X-rays showed filling in of the fracture at the base of the femoral head superiorly. The possibility of non-union was discussed, along with treatment options including the continuation of the bone stimulator or undergoing a procedure to remove the hardware and place a compression screw. The patient chose to continue with the bone stimulator. 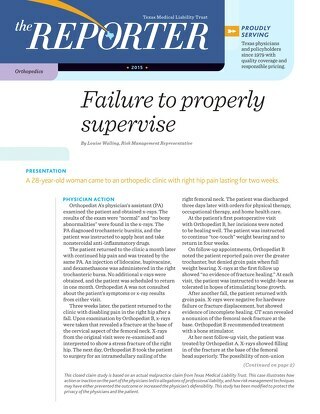 The patient returned the next week with increased right hip pain. 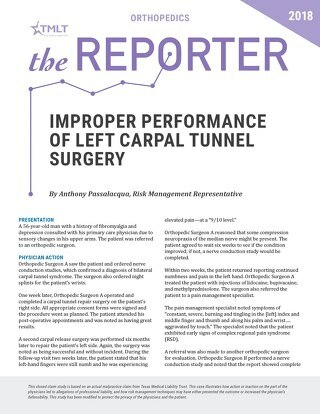 Orthopedist B treated the patient, and x-rays showed some superior migration of the helical component of the trochanteric fixation nail (TFN). 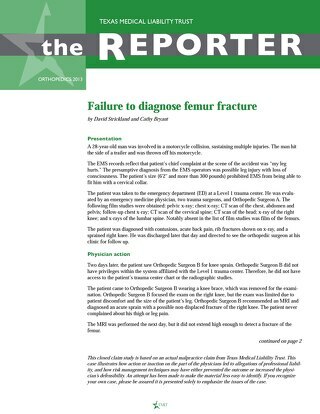 Orthopedist A noted that the x-ray showed “further fragmentation” of the femoral head and a concern for avascular necrosis (AVN). 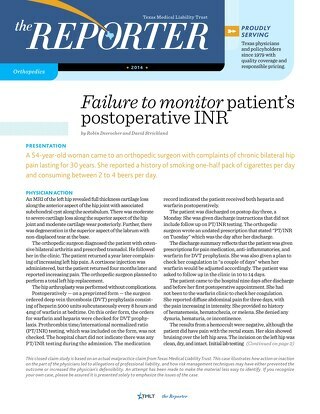 These findings were discussed with the patient along with instructions to discontinue the bone stimulator. She was made aware of the possibility of a hip replacement if her femoral head continued to deteriorate. Orthopedist A discussed the case with a trauma surgeon, Orthopedist C, who agreed to evaluate the patient. 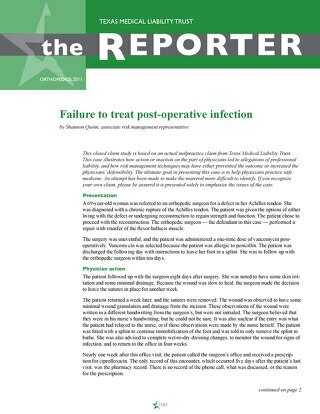 Orthopedist A documented that the consensus among the physicians, including a joint specialist, was to proceed with hardware removal and obtain an MRI to assess the viability of the femoral head. The patient returned for a preoperative visit the next day. Orthopedist A told her that he would remove the TFN, previously placed during Orthopedist B’s surgery, and perform a bone graft. He also confirmed the need for a future hip replacement. 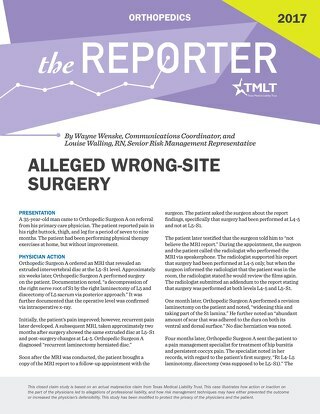 The patient underwent the procedure to remove the hardware, TFN, and subsequent bone grafting of a defective right proximal femur. 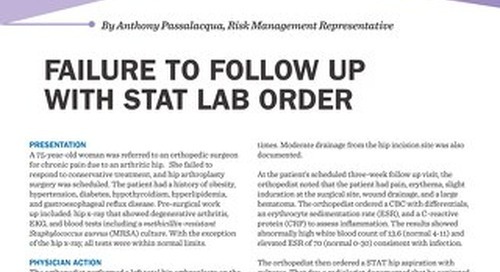 Orthopedist A noted that the femoral head appeared stable. A week later, at the patient’s first post-operative appointment, x-rays showed “no significant change in the alignment of the femoral head.” Orthopedist A noted the basic cervical fracture of the right femur appeared to be in the advanced stages of healing. He instructed the patient to remain non-weight bearing and to return to the clinic in one month. The patient failed to keep this appointment. Two weeks later, Orthopedist A called the patient. The patient reported she was giving her hip more time to heal. 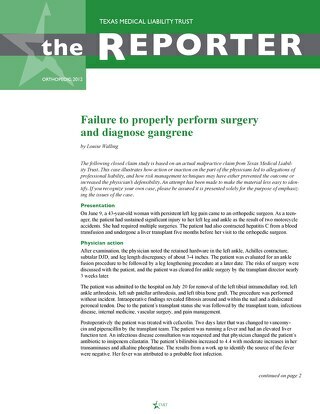 failure to adequately treat the patient. 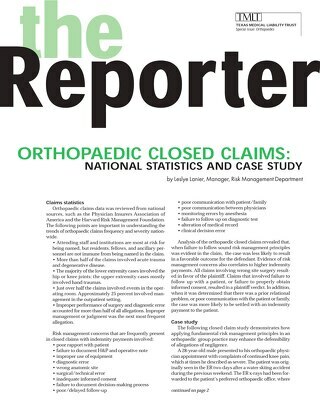 The main issue in defending this case was Orthopedist A’s responsibility to supervise the PA. Also, Orthopedist A expressed his opinion that the initial fracture most likely caused the development of AVN that led to the need for the hip replacement. 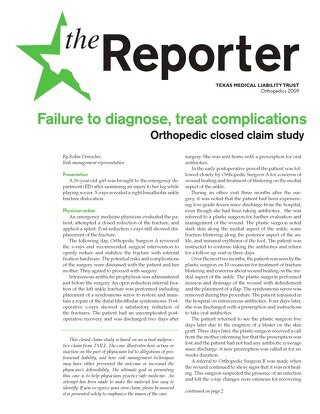 This case was settled on behalf of Orthopedist A.
Texas Occupations Code 157.001(b). Available at: http://www.statutes.legis.state.tx.us/Docs/OC/htm/OC.157.htm#157.001. Accessed February 19, 2015. Texas Occupations Code 204.205. 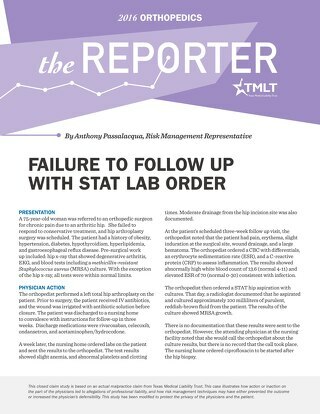 Available at: http://www.statutes.legis.state.tx.us/Docs/OC/htm/OC.204.htm#204.002. Accessed February 19, 2015. Texas Occupations Code 204.204(a). Available at: http://www.statutes.legis.state.tx.us/Docs/OC/htm/OC.204.htm#204.204. Accessed February 19, 2015.